Alice M. (Jensen) Hansen, age 89, passed away Tuesday, April 10, 2018, surrounded by family, at the Wisconsin Veterans Home in King. She was born in the Town of Farmington, WI on December 19, 1928 to the late Paul S. and Marie E. (Radley) Jensen. On June 19, 1948, she was united in marriage to Lewis C. Hansen, who preceded her in death on March 19, 2017. Alice was a graduate of Waupaca High School and Wautoma Normal School and went on to become a teacher with the rural and Waupaca school systems. She was also employed as a bailiff with the county courts after retiring from the Town of Dayton where she was the Town Clerk for many years. 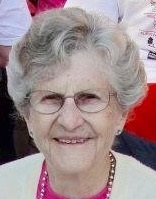 She was an elder of Trinity Lutheran Church and served as a bible study instructor. Alice worked hard for the American Cancer Society, was a VFW Auxiliary member, was a hospice volunteer, and helped start the Reach for Recovery Program, having been a cancer survivor herself since 1973. She served as an officer of the Rural Cemetery Association and the Rural Gorgonas Club. Her other hobbies included gardening, being a wonderful hostess, cooking, knitting (everyone had a hat made by mom), and caring for her yard and home, alongside Lewis. Alice is survived by her children: Mary E. Mathwig, Waupaca; Michael J. Hansen (Lorrie Krueger), Bozeman, MT; Holly M. (Daniel) Bacon, Amherst; and Heather C. (John) Schmit, Ecuador; grandchildren: Cariann (Rob Ramseier) Mathwig-Ramseier, Krista (Joseph) Kostuch, Paul (Stephanie Kroner) Hansen, Heidi (Paul) Smidansky, Stephen (Erin) Hansen, Joshua (Debora) Bacon, Mara (Michael) Syring, Sally (Scott) Aho, Stephanie Wheeler, Kristin (Michael) Harvey, Beth VanEngen (Robert Crofts), and Jordan (Kailea) Schmit; 24 great-grandchildren, other relatives and friends. She was preceded in death by her parents, husband, two brothers and three sisters. A Celebration of Life will be held at 11 a.m. Saturday, May 19, 2018 at the Maple Crest Funeral Home, with Chaplain Wayne Schwanke officiating. Visitation will be held from 9:30 a.m. until the time of the service. The family extends their heartfelt gratitude to the staff at Park Vista and the Wisconsin Veterans Home.